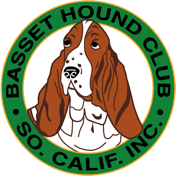 Basset Hound Club of Southern California, Inc.
Arcadia is east of Pasadena and west of the 605 Freeway. To get to the event take the 210 Freeway to Santa Anita Avenue in Arcadia, California. Go south on Santa Anita Ave. to Huntington Drive. Turn right on Huntington Drive and go past the park. Keep going on Huntington Drive as it turns the corner. Iy is now a one way street. Go Past the police department to Centennial Way and turn left. At the end of Centennial way turn left back on Huntington Drive going north. The parking lot will be on your right. Enter the parking lot and find a spot. The event is near the north end of the parking lot.